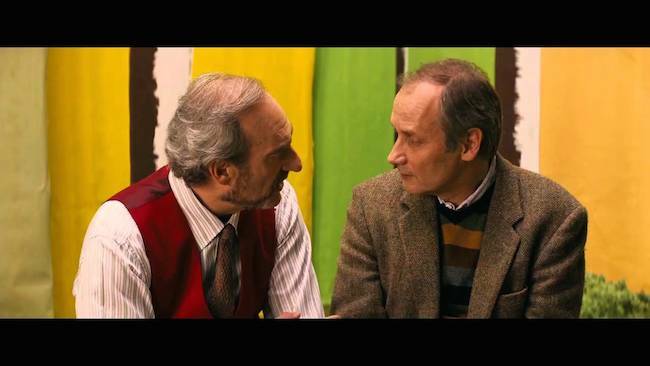 Life of Riley is the final film from renowned French director Alain Resnais. Resnais has a very successful career, and Riley was the perfect movie to close his journey as an artist. The film takes place near York, although all of the actors and dialogue are French. It’s about three couples and how they cope during the final six months in the life of their friend George. George has meant something to each of them, and his mortality and actions force all of them to reexamine their own lives and relationships. The film centers around a play three of the characters are starring in. They rope George into playing one of the parts to give his mind something else to focus on. This is one of the reasons Resnais chose to shoot this film as if it were a play. All the cut scenes are outdoors, generally from inside a vehicle driving to the next location. There are also cut scenes where painted or drawn representations of the locations are used. Once the audience arrives at the new location, the scenes take place on what appear to be stages. The actors do not leave the confines of the set, the scenery (including shrubbery and flowers) are all clearly fake, and even the backdrops are no more than painted strips of cloth where the characters enter and exit. This is a very effective style for a movie like this, as it affords the best of both worlds. The cinematography and scenery allow for a more play-like feel to the film, and that is definitely accentuated by how the actors conduct themselves onstage. However, since this is a movie, they are still able to cut in for close-ups to pick up the subtleties of the actors’ performances. As a member of the audience, it feels like you are on the stage with them during the play. The most fascinating part is that there are only seven people in the film, and none of them are George. Just the three couples his death directly affect, and one of them has a child. There are many other characters that are discussed at length, but they are never actually seen. This was a very interesting choice and it worked perfectly here. It left an air of mystique to George as we only saw him through the eyes of his mourners. Life of Riley arrives on Blu-ray with a strong presentation, thanks to a solid AVC encode. It isn’t the best video quality for the picky, but the details are fine and the average moviegoer wouldn’t complain, let alone notice any shortcomings. While the image appears a bit soft, the colors are extremely vibrant and help to draw the viewer in. This essentially makes up for the soft focus and balances the shot well, helping any detail that would normally get lost with a soft presentation stay well above standard quality release. Colors remain strong throughout the movie and help paint the picture the film sets out to deliver. The audio is presented on a French DTS-HD Master Audio 5.1 Surround track. It sounds great, especially considering it was essentially shot on a stage. There are no echoes, making the audio sound as it was either handled well in post-production or that the efforts during filming were great. Although the movie is dialogue heavy, when there is music, the mix is nearly perfect. A great use of the speakers in the room. Life of Riley‘s audio remains clear throughout the entire feature. Life of Riley only comes with a handful of extra features. There is a sixteen-minute cast interview in which they discuss the career and vision of Resnais as well as the film itself and the play on which it is based. The trailer is also found on the disc. There is a fourteen-page booklet with an essay from Glenn Kenny about Resnais and his last film. There is also a nice write up from Resnais himself about his film and why he made the choices for it that he did. Life of Riley was a very good film and a great one for any auteur to end their career on. Despite the subject matter, it is quite fun and presents an interesting marriage of stage and screen.